A lump of minced chuck on your plate or steak tartare? What will it be, what are you prepared to pay for it, and how much will you rave about it later? Menu items can sound so much more delicious when written in another language. I am in a small family run hotel in an ancient village set against the backdrop of a mountain range that within twenty kilometres or so will see peaks reaching 3000 metres. 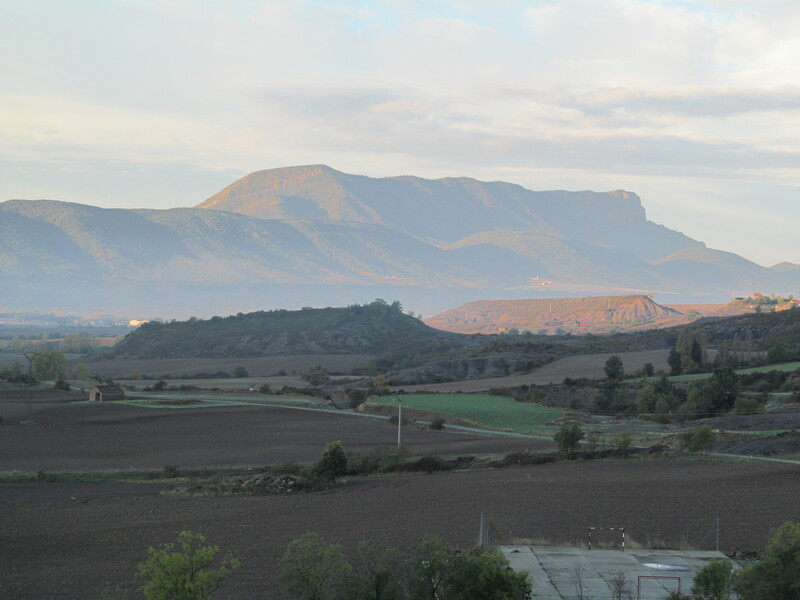 This farming village looks out over a wide agricultural plain which in turn is protected on the other side by another sierra. Early one morning, it appeared like this. Dinner my first night and I discover that there is a maestro in the kitchen: imagine how good this tastes – hojaldre relleno de mouse de pato con salsa de setas. 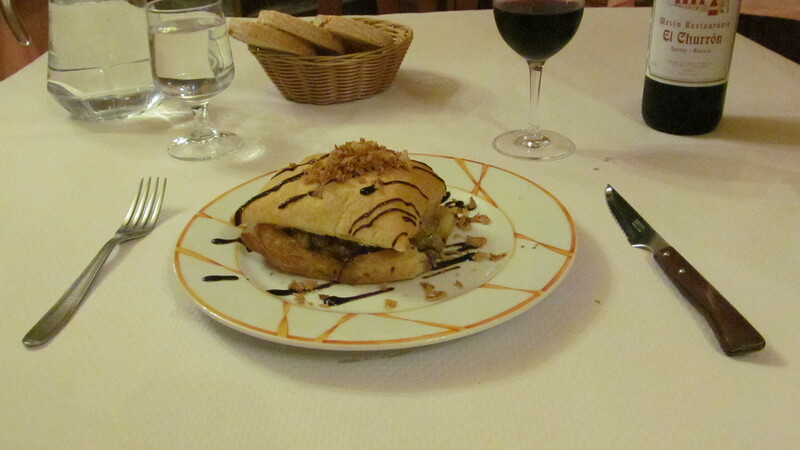 Duck pate in a wild mushroom sauce in a puff pastry. All local ingredients. Delicious also in English, and one of the most memorable plates of food that I have ever tasted. Second course was wild boar, savoury, very tender, in the style of the area, and so typical of Spain, just the stew served without any vegetables. Complete with peach cake and a bottle of wine – 11 euros. $15 Canadian. 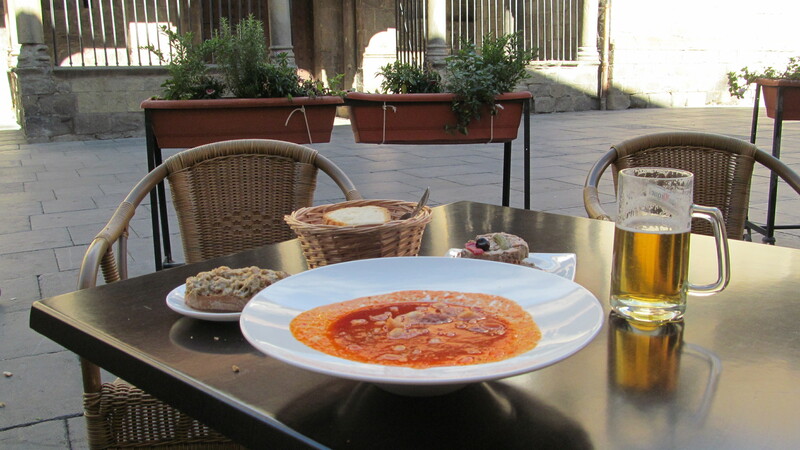 I had lunch the next day in the city of Jaca. If I did live in Spain, I would want to live in or near this, I am going to say it again, ancient city. 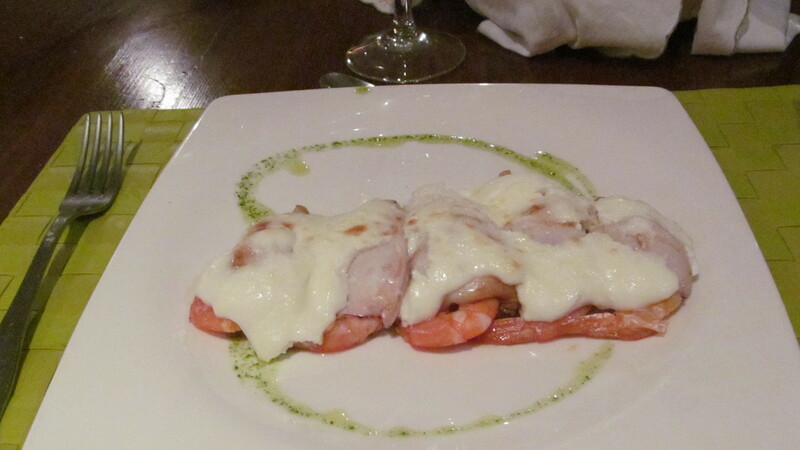 Chiperones rellenos de langostinos gratinados con crema de ajo. Baby squid (this time without the little bundles of legs – I have gotten almost used to them) stuffed with prawns in a garlic cream. And one final photograph. A few years ago, passing through Jaca, I stopped for a quick gander and a coffee. I entered the Casa Fau on the cathedral square and found myself in tapas heaven. That coffee and one tapas and I have been now back here twice on purpose; in the spring, I made a lunch of tapas. A few hours after the prawns and squid, I enjoyed a “light” supper here. To the left are wild mushrooms on toast, tucked in behind is a house pate, and at centre stage is a bowl of soup which brought joy to my taste buds. From a simple tomato base, garbanzos and sausage were thrown in. Then, the magical ingredient – orange, juice and peel in sufficient quantities to produce a delectable orange soup. A revelation, a delight, something to remember and try at home. This entry was posted in Uncategorized on October 24, 2012 by agnotarte. Wow You can find the most amazing treasures Ed. Eduardo: I think it is your duty – after torturing us with those beautiful photos of all that food – to come home with the recipe for the orange soup!